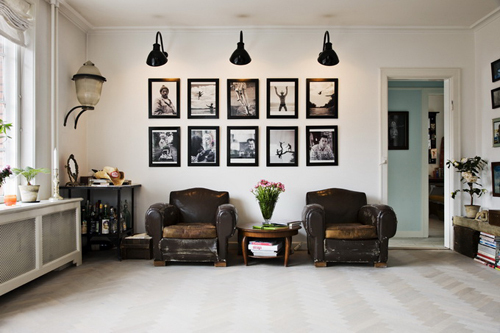 Scandinavian style interior inspiration from the portfolio of Danish photographer Morten Holtum! those beaten-up arm chairs in the first photo are wonderful! they kind of remind me of a pair of worn-in frye boots for the home. I just enjoy the very danish expression in these pictures.The black and white together looks beautifull. I would like to have the lamp that is over the bathtub! My all time favorite style! Love it! YAY! dark furniture! as much as i love light colors, whimsical decor, and turquoise blue… these dark and masculine decor elements are like a breath of fresh air for me! i LOVE them. they make me feel more grounded. Beautiful! I love those big distressed leather armchairs. Love the framed photos and the white washed hardwood floors. i am in love with that bathroom. i would sit in that tub all day long! I love the first picture with the nice armchairs and the b&w photographs. The bathroom is very nice with that huge chandelier! Wow, that bathtub and chandelier is my idea of heaven! This style is incredibly popular among kitchen designers in particular, and I can’t help being attracted to the warmth, and versatility of this design myself.